The Knossos Game, also known as Zatrikion, dates to about 1600 BCE, and was discovered in 1901 by Sir Arthur Evans during his archaeological excavations of the Knossos Palace on Crete. There is only one copy of this game in the world, since other copies have never been found anywhere else. 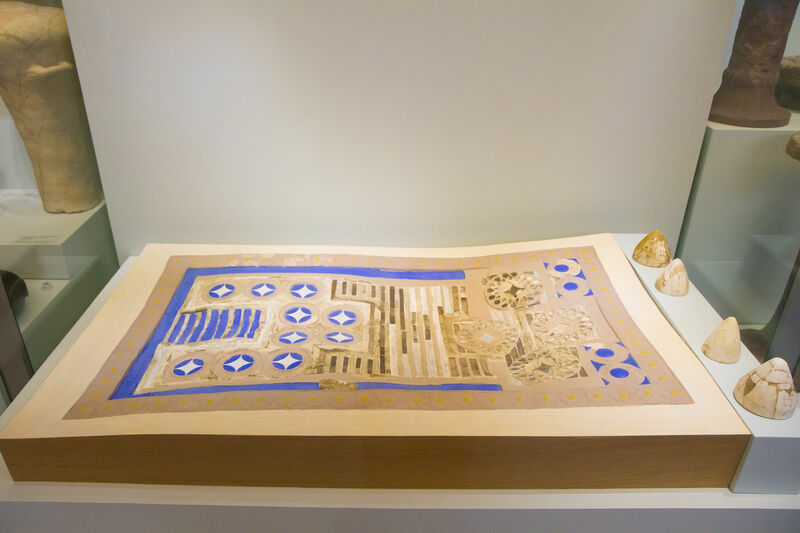 The original game was made with inlays of ivory, rock crystal, and glass paste, decorated with kyanos blue and gold and silver sheet metal, on a wooden base. Four ivory gaming pieces were found nearby. The game most probably belonged to a member of the Minoan royal family who resided at the Knossos Palace. The original game is kept at the Heraklion Archaeological Museum on Crete. Knossos Game, Heraklion Archaeological Museum, Crete, Greece. Photo: Garrett Ziegler, April 21, 2016. The rules of the game are unknown and due to the strange appearance of the board most classical game reconstructionists have not even attempted to reconstruct the rules. However, two rather successful recent attempts have been made to reconstruct the rules of the Knossos Game, ironically, both made by science fiction writers. The first set of rules was proposed in the book written in Greek, and published in 2007, by Eleni Dragona (Ελένη Δραγώνα) and Christos Z. Konstas (Χρήστος Ζ. Κώνστας), called in English, “The Ancient Greek Book of the Dead” (Η αρχαιοελληνική Βίβλος των νεκρών). Dragona is an archaeologist, but Konstas is a science fiction writer. The second set of rules was developed by a Russian game re-constructor, who also happens to be a science fiction writer, Dmitriy Skiryuk (Дмитрий Скирюк) and originally published on his blog, in Russian, in 2011. 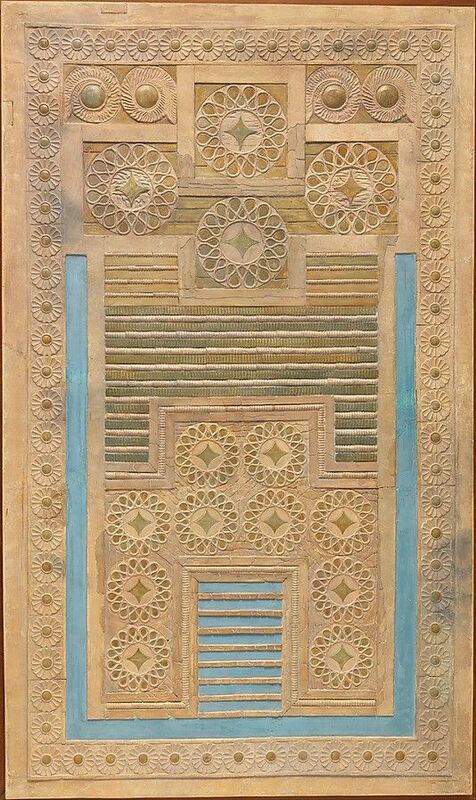 E. Gilliéron & Son, Painted plaster reproduction of the Knossos gaming board, 1916-1920. The Metropolitan Museum of Art, New York, Rogers Fund, 1917 (17.231). Before jumping into the details of the rules of the game play, both Dragona and Konstas, and Skiryuk explained what the features on the board actually represent. Their explanations differed and therefore resulted with a different interpretation of which features on the board are actually playing cells, and are not just decorative, and in what sequence do the pieces move on the board. Both interpretations result in a different playing sequence with some features either defined or not defined as a playing cell. 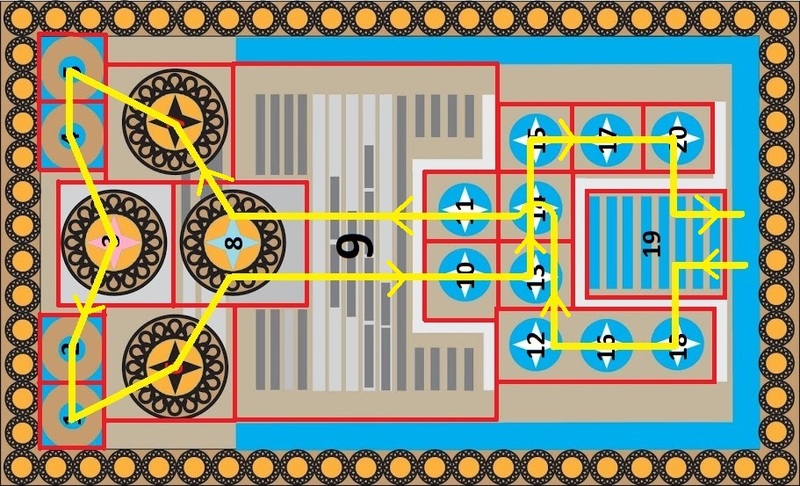 Dragona and Konstas explained that the section of the board with 10 same circles (bottom of the board) represents The Land of the Living, where as the section with 8 circles of two different types (top of the board) represents The Land of the Dead – Haydes. The brick-like pattern in the middle of the board represents the river Styx, which had to be crossed in order to pass from The Land of the Living into Haydes. The purpose of the game was to pass from The Land of the Living into Haydes and then return back to life, sort of as a life cycle simulator. Skiryuk interpreted the game as a reflection on Crete’s central life style – seafaring and trading. He explained that the board must be oriented vertically with the 10 round cells at the bottom and the 8 round cells at the top. The 10 round cells at the bottom were a representation of the map of Crete. The 8 round cells at the top represented islands of other countries around the Mediterranean Sea. The lines in the center represented the Aegean Sea which had to be crossed to get to other islands. Finally, the playing pieces represented the Minoan ships which traveled from Crete to various islands to trade. Skiryuk compared the shape of the pattern of the playing cells on the board to the shape of the board of the Royal Game of Ur, and outlined the same 20 squares on the Knossos board. This led him to the conclusion that the game play between the two games should be very similar. According to Skiryuk the game board is divided into two blocks, the large one (10 cells) and the small one (8 cells). On the large block all cells are the same size and have the label of the 4-pointed star. On the small block, 4 larger cells are labeled with rosettes in different colors and materials. The side rosettes are both black, symbolizing danger. The lower one is light blue, symbolizing water, where as the upper one is made from terracotta, symbolizing dry land. Skiryuk explained, that the remaining two cells were the Aegean sea area in the middle, which would hold many pieces simultaneously, since many ships could swim on the sea at once, and the blue area in the center of the large block was a bay of water which was located in the north-west corner of Crete, and is called Kolpos Kissamou – The Bay of Kissamos, and was a safe cell, just like a bay would be a safe heaven for ships. This tallied the number of playing cells to 20, which made it the same as The Royal Game of Ur – The Game of 20 Squares. Skiryuk concluded the each player probably had 7 playing pieces, just like in The Royal Game of Ur, even though Evans found only 4 playing pieces together with the game. Neither Dragona’s and Konstas’ rules, nor Skiryuk’s rules, are complete in order to play the game without any questions. I have decided to merge them, and add some of my own rules to make the game complete. The game includes the board of 20 cells, 5 white pieces, 5 black pieces, and 3 tetrahedral dice with two of the peaks of the pyramid marked in a different color than the other two peaks. Whichever players scores 1 first starts the game on cell 18 or 20, on their own side. It does not matter who gets to have white or black pieces. As the game continues all pieces of the first player continue to move on the board according to the path shown with yellow arrows, where as the opponent’s pieces move on the same path, but in the opposite direction, as shown with green arrows. Movement is only allowed in the direction of the arrows. Moving backwards is not allowed. All cells on the large block, cells 18, 16, 12, 13, 14, 11, 10, 15, 17, and 20 are not safe cells. Only one piece can occupy any of these cells at a time. If the opponent lands one of their pieces on an occupied cell in the large block it will knock off the player’s piece off the board and that piece goes to the beginning of the game. Pieces can knock off each while moving in either direction on the path. For example, if the player’s piece just started the path and the opponents piece is already returning back to cell 19, the bay, either one of them can knock the other piece off if they land on an occupied non-safe cell. Cells 12, 16, 18 and 15, 17, 20 are located next to the wall and give the player a second turn if they land on them, while going in either direction. After cells 10 or 11, all pieces move onto cell 9, the sea, regardless of the value of their dice score. Cell 9 is shared by all pieces, and there is no limit to how many pieces of the player or the opponent can sit on it simultaneously. Cell 9 is a safe cell. Pieces do not get knocked off from it for any reason. Since the sea is a very large cell, players should keep their pieces on their respective sides of the direction of motion, in order to not confuse which piece is moving forward and which piece is moving backwards. The sea cell is large enough to hold all of the 10 pieces in the game. Although only 7 pieces can be held on a given side simultaneously, it is highly unlikely that all 10 pieces will be stationed in the sea and moving in the same direction all the same time. I believe, that for this reason, the designers of the playing board did not feel that the sea needs to be made bigger. In order to move from cell 9, the sea, on to the small block the player must score with the dice either a 1 or 4. If they score 2 or 3, they must stay in the sea or move other pieces that are not in the sea. From cell 9 the pieces continue their path on to the small block as shown with arrows. After completing the small block the piece return to the sea and then onto the large block, and complete the game by landing into cell 19, and then off the board. Cells 3, 6, 7, and 8 are large and can hold 2 pieces at a time, whether the player’s or the opponent’s. A 3rd piece is not allowed to land on these cells and the move is forbidden. Cells 1, 2, 4, and 5, with a small blue circle, are safe cells and can only hold one piece at a time. If an opponent’s piece lands onto any of these cells while they are occupied, the move is forbidden, and the player must move a different piece or skip a turn. Cell 8, labeled with a rosette with a light blue 4-pointed star, is a safe cell. Opponent’s pieces cannot knock off the player’s pieces in this cell if the move is allowed. This cell is also a mandatory cell. All pieces must stop on this cell after exiting the sea (cell 9) and prior to entering the sea (cell 9), regardless of the score of the dice. The light blue color (light blue ceramic glaze on the original) signifies that this cell has a special function, which requires all pieces to stop on it. The light blue color symbolizes a bay docking station after and prior to entering the sea. Cell 3, labeled with a rosette with a pink 4-pointed star, is a safe cell. Opponent’s pieces cannot knock off the player’s pieces in this cell if the move is allowed. This cell marks exactly the center of the game. The pink color (red terracotta on the original) signifies that this cell does not have a special function, like the light blue cell 8, and it is a safe cell, as opposed to the white stars which are not safe. Cells 6 and 7, labeled with rosettes with a black 4-pointed star, are potential traps. When a player lands on either of those cells they must throw the dice again. If they score a 2, the piece returns back to cell 9, the sea during the first crossing. If they score a 3, the piece stays in its place. If they score a 1 or 4, the piece moves off the cell and goes to the corresponding cell forward. After a piece completes its path on the small block, it must enter cell 9, the sea, again on its way back. In order to return to the large block the player must score with the dice either a 1 or 4. If they score 2 or 3, they must stay in the sea or move other pieces that are not in the sea. Cell 19 is a safe cell and can hold up to a total of 4 pieces, which belong to either the player, the opponent, or both. Pieces on it cannot be knocked off. From cell 19 each piece can move off the board with any score of the dice. Pieces can move off the board from other cells, 12, 16, and 18 or 15, 17, and 20 but only with an exact score of the dice. From cells 12 and 15, on the score of 4; from cells 16 and 17 on the score of 3; and from cells 18 and 20, on the score of 2. The player who moves their pieces off the board first, wins. Main stratagem in the game is avoiding landing on cells where opponent’s pieces coming from the opposite direction can knock the player’s pieces off the board. For example, cells 13 and 14 should be avoided at all cost, because there is a really high chance that the opponent’s oncoming pieces will knock off the player pieces that are already sitting there. For the same reason, white cells on the sides give each player a second turn so that they have a higher chance of avoiding those cells. On the return path the side white cells second turn improves the chances of each player to actually reach the end as opposed to getting knocked off almost at the end of the path. The throwing sticks or the conical dice have uneven probability for different scores, as compared to a six sided cubic dice, which makes them more frustrating and exciting at the same time. This list is 4 throwing sticks. The least frequent dice score is 4 and 5 (probability is 1/16). For this reason, playing the game with a six sided cubical dice instead of the throwing sticks or three conical dice significantly ruins the experience of the game, since it equalizes all probabilities of the scores and avoiding specific cells stratagems stop being applicable. The first black cell on the path can be entered only with the dice score of 1, since the previous cell is mandatory. Since the dice score of 1 has a middle probability of occurring, this gives each player only a probability of 4/16 (25%) to land on this trap. However, the second black cell can be landed from any of the previous cells with any score of the dice, and therefore the probability of landing on it is much higher. The Knossos Game is more driven by chance than by strategy, which makes the players think not as hard, and the game a lighter play. Ελένη Δραγώνα, Χρήστος Ζ. Κώνστας. “Η αρχαιοελληνική Βίβλος των νεκρών”. Αρχέτυπο, 2007. Hillbom, Niklas. “The Knossos game board.” Opuscula Atheniensia 29 (2004): 39-71. Brumbaugh, Robert S. “The Knossos Game Board.” American Journal of Archaeology 79, no. 2 (1975): 135-137. Hillbom, Niklas. Minoan Games and Game Boards: An Archaeological Investigation of Game-related Material from Bronze Age Crete. VDM Verlag Dr. Müller. 2011. Thank you so much for posting this. Since I first saw a photo of this amazing board I have been looking for possible rules. I love the two interpretations, and the idea that pieces may occupy the “ocean” space as well as the circles. My only question is that in step 3 you describe 3 dice with a maximum possible score of 4, but throughout the rest of the rules you mention a score of 5, and your discussion of the probabilities make it sound like four dice should be used. Since no dice were found with this game, I guessed that it might have used 3 dice like Royal Game of Ur or 4 throwing sticks like Senet or Aseb. So either one will work. The probabilities will be different depending on whether you use 3 or 4. The so called “Royal Game” of Knossos is NOT a game. According to my 7 years of study of Minoan kernoi, I have concluded that the Minoans on stone flat kernoi marketed days , Minoan “weeks”, “months” one solar year and a 4-years solar calendar. I wrote an article for the journal “EIRENE”, 2015, pp. 221-234 which is edited by the Institute of Philosiphy of the Czech Academy of Science, Prague. There, you can find my documented arguments; nevertheless in short I can explaine to you the first 4-year solar Minoan calendar WORLDWIDE. It is worthwile mentioning that Sir A. Evans and his team reconstructed the above artifact with such accuracy. They made two errors. In the above no. 19, Evans constructed 8 instead of 9 bleu lines, which are places for the calendar-tender to mark with day-pawns the 9 days of a Minoan “week”. In no. 9, the sum of 4+4+4+4 lines in the 4 corners plus the 6 bigger lines make the sum 22 lines, which should be 23 [=(4+4+4+4) + 7]. Summary: a Minoan “week” lasted 9 days, above no. 19. One Minoan solar “month” is composed of 4 Minoan “weeks” or 36 days, above no. 1,2,3,4. The 360 days a part of one Minoan solar year (365 days) is composed of 10 solar months of 36 days each, above no. 10-18 +20. The rest 5+5+5 days for cmpleting the three 365 days and the 6 days for completing the fourth-leap year of a 4-year Minoan solar calendar sum up to 21 days. In the “Royal game” of Knossos the 23 completion days to 365 or 366 days of a solar year should be distributed as follows: four times 4 lines (=16 days) plus 7 bigger lines (7 days) in the center of the artifact. Thank you. I would be interested in reading your paper. Hey Buddy!, I found this information for you: "Knossos Game – Zatrikion". 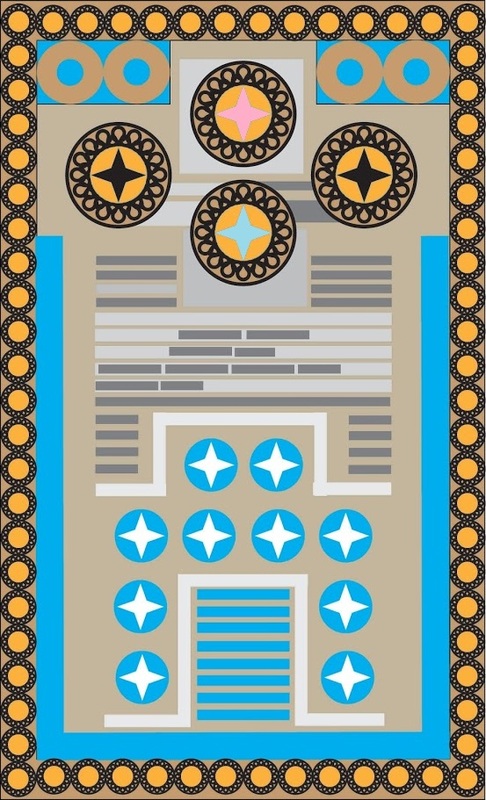 Here is the website link: https://www.ancientgames.org/knossos-game-zatrikion/. Thank you.